ITT Tech abruptly shut down its 130 campuses earlier this month, leaving 35,000 students without a degree and 8,000 employees without a job. But if you were paying attention, the school's demise shouldn't have been a total shock. 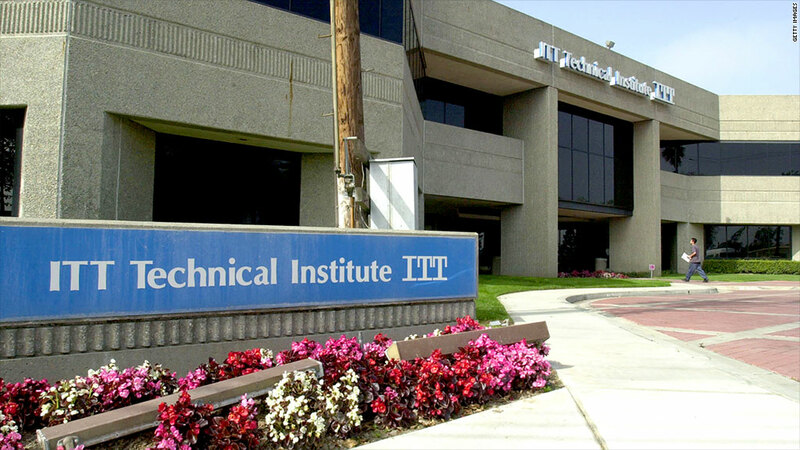 The government and an independent accrediting agency had shown concern for years about ITT Tech's marketing practices and its graduation and job placement rates. Over the past two years, ITT had been sued by two federal agencies and both the New Mexico and Massachusetts attorneys general. It also had received subpoenas and/or requests for documents from 17 other states and the District of Columbia, a recent financial filing indicates. At the heart of many of the lawsuits and investigations is the question of whether this for-profit school was acting in the students' best interests. And stakes were high for the government, which said the school was becoming a risk for both students and taxpayers. ITT Tech received about 83% of its revenue from federal dollars during the 2013-2014 school year, amounting to about $784 million, according to the most recent government data available. That's why ITT closed its doors when the Department of Education pulled the plug on its federal funding for new students and subsequently filed for bankruptcy on September 16. The final straw, the department said, was that ITT had failed for a second time this year to prove to its accreditor, the Accrediting Council for Independent Colleges and Schools, that it was in compliance with certain standards, including low student retention rates. As of September 22, ACICS has been stripped of its authority to accredit schools. An ITT spokeswoman reached for this article did not offer any specific comment. She instead referred CNNMoney to the company's latest public financial filing for updates on the ongoing litigation and a previous response to the Massachusetts lawsuit in which it said it would fight the suit. None of the suits mentioned here have been resolved. So what, exactly, was the problem with ITT? ITT marketed itself as a career school whose grads were sought out by employers. Its TV ads often depicted students struggling financially before attending ITT, but happy in their careers after graduating. CNNMoney heard from nine former students who said one of the primary reasons they enrolled at ITT was because they thought they'd be able to land a good job once they graduated. But they ultimately were never able to find work in their field. "They promised me a job placement," said Sarai Gonzalez, who got an associate's degree in criminal justice. She found work with a security company, but wanted a job in law enforcement. When she couldn't land one, she went back to an ITT career counselor to ask for help. They suggested she re-enroll for her bachelor's degree, which she completed in June -- but still hasn't found a job as a police officer. Related: What's next for ITT students? The Massachusetts Attorney General lawsuit alleges that ITT misled students about its job placement rates to get them to enroll. It told prospective students that 100% of those who graduated from its Computer Network Systems program at the Norwood campus found jobs, while the actual placement rate was about 50% or less, according to the complaint. ITT has said some of the attorney general's claims "rest on a biased and selective portrayal of the facts." But ACICS, the accreditor, also took issue with the way ITT counted the number of graduates who found jobs in their fields of study. In a letter, it asked the school to explain how, in some of its job placement rates, it justified including someone who uses skills taught at ITT only 20%-49% of the time on the job. ACICS says that a job must require skills learned at school as a "predominant component of the job" in order to be counted. A lot of students spent years in school and thousands of dollars, only to find their degree would never land them a new job in their chosen field. Why? Because in many cases, the school's professional programs lacked the accreditation to work in those areas. For example, none of ITT's nursing programs had a nursing-specific accreditation. Without the specific accreditation, a graduate can still sit for a licensing exam. But many employers simply won't hire someone whose degree comes from a school that doesn't have the accreditation. And it will be hard for students to transfer credits or pursue a bachelor's or master's degree in nursing at another school. In one ongoing lawsuit, the New Mexico Attorney General alleges the ITT campus in Albuquerque misled students into believing the program either already had the nursing accreditation or would receive it soon. But in reality, the school never began the formal application process. "As a result, numerous New Mexico students have enrolled in ITT's program, only to find themselves unable to secure employment upon completion of their degrees," the state said in a court document. In addition, ITT's nursing and other programs across the country weren't regionally accredited, which made it hard for students to transfer credits to community colleges and public schools, most of which are regionally accredited. The Consumer Financial Protection Bureau alleges that ITT "exploited" students who may not have known that a regional accreditation was more preferable than a national one. Tom Gesiorski, who graduated from ITT in 2010 with a bachelor's degree in criminal justice, is one of those students. He still works for the same security company he did before he got his degree. Gesiorski says he wasn't able to get a job as a police officer because the school didn't have a regional accreditation. "They tell you you can apply for these jobs, but they're basically feeding you a line of crap," Gesiorski, 37, told CNNMoney. Now he's paying $192 a month for his federal student loans and in default on the $30,000 he borrowed from ITT's private loan program. The New Mexico lawsuit and one from the Consumer Financial Protection Bureau allege that the school misled students about the private loans it offered between 2009 and 2011. While a majority of ITT students took out federal loans, they didn't always cover the full cost. To make up the difference, ITT would offer its private loans, which, according to the CFPB, sometimes carried interest rates that exceeded 16% and came with 10% origination fees. At the same time, a federal loan carried a 6.8% interest rate. Sometimes, ITT would initially offer the student a zero-interest temporary line of credit. But if it wasn't paid off within nine months, ITT would suggest taking out one of its high-interest private loans. In 2015, the Securities and Exchange Commission alleged in a suit that ITT's CEO and CFO "engaged in a fraudulent scheme" to conceal the "extraordinary failure" of its private loans. The company has projected a 64% default rate on its private loans, according to the CFPB lawsuit. CNNMoney heard from more than 60 former students and several former teachers about their experiences at ITT. Some claimed that equipment was "outdated" and that some teachers were "lazy." But others said they loved the program and thought the quality of the classes and instructors was very good. One former lecturer, Austin Troxell, said coursework was dated and "designed for pupils with a fifth-grader education." He said, for example, that the curriculum he was given to teach a digital forensics class in 2009 included a lesson on floppy disks. Another former instructor, Jeff Drobman, says the curriculum (which was handed down from ITT corporate) wasn't the problem. He said the program was excellent and sometimes required him to assign too much work. But he didn't believe that an associate's degree in some majors, like engineering, really prepared anyone for a job in the industry. And he thought the biggest problem was the school wasn't selective enough. Too many students, he said, wouldn't show up to class. Low retention was another reason ITT had been on thin ice. Its largest campus reported a retention rate of just 52% last year -- well below the standard of 60%. "The real problem was that the school didn't do a good job of vetting the student population. There were people who should be there and those who shouldn't be -- and there were too many of those," Drobman said. Correction: An earlier version of this story incorrectly stated that ITT Tech received $784 billion from the government during the 2013-2014 school year. It was $784 million.